Submitting your sitemap to search engines is as important as creating your blog/site itself. If you are really serious about getting traffic to your blog and having all your blog contents indexed by search engine then you have to submit your sitemap to all the major search engines. Have you heard of Bing or Yahoo? are you ignoring it? or do you just submit your sitemap to Google and then relax. Google may be the biggest and most popular search engine but if there is any search engine that can come close to rivaling it then it is Bing. So if you have not submitted your sitemap to Bing/Yahoo the complete tutorial below will teach you how you can do that effectively. 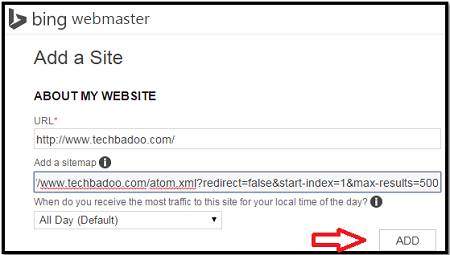 Yahoo merge with Bing, so there is no need to submit to Yahoo again once you have submitted to Bing, the Bing webmaster tool is so similar to Google webmaster tool and I found it easy to understand my site stats from my Bing dashboard. Follow the guide below to have Bing indexing your blog, If this is first time you are opening/signing up account with Bing, check to see if they have an ad bonus for you. When I first sign up with Bing I got $100 bonus to advertise on their platform. Go to Bing Webmaster tools and sign up or login. Then on the next page add your blog url and click "ADD" button. After clicking "Add" Bing will take you to next page "About My Site" to submit your sitemap. Now to submit your sitemap just cope the code below and place in the required box, then change the url there to your own. Next is to Verify your blog, if you are using Blogger platform then the easiest way to verify your blog is by using the "Option 2" which is to add the meta code Bing will give you to the head of your template. To add the code to your Blogger and verify your site. Go to Blogger and click on "Template"
Use control F on your computer to find </head> in your html template. Then click "Verify" on Bing to verify your blog. Now Bing will begin indexing your blog, Bing can show you the keywords you ranking high for, so always check your Bing webmaster's tool as often as you check your Google webmaster's tool. Martins is a passionate blogger who enjoys writing articles on techs, blogging tips and reviews. He is a "Gold Star" contributor to many top blogs and also a freelance writer. How to start the Online Bussiness ? To start the Business in online is very simple and more profitable . Today starting the Website desining Company is one of the more profitable business with less invesment. We are having the talented Team with 8 years Expereince in webdesign business , which will guide to start the software company quickly with lesss effort. Now a days all the business are moving towards online . Too start the company we need correct Business Model and thats Chase4Net . We will help you to setup the Website design Company at less cost . The website desing compnay can offer the following Logo design,website design , webhosting , domain registartion ,android app development . Even If you do not know how to develop wensite no woriess . Chase4Net will be there always with you , we can help you on the business by developing a websiite a behalf og you. bill software desing |,job website design |,tickect booking website design | ,matrimonial website design |,RealEstate website design . You just become a website design company reseller program , We will take you to the next level. How to start the software company ? To start the in Software comany is very simple and more profitable . To start the business first you need a Team which supprt for your everything. In todays software development is nothing but a web application . To develop a webapplication you need start the Website desining Company is one of the more profitable business with less invesment. There are many business includes in website developmet - Logo design,website design , webhosting , domain registartion ,android app development . Even If you do not how to develop wensite no woriess . Chase4Net will be there always with you , we can help you on the business by developing a websiite a behalf og you. bill software desing | ,job website development |, tickect booking website development | ,matrimonial website development |,RealEstate website development . You just become a website design company by website desgin reseller program , We will take you to the next level. Hello. We are the Seowriterluv, After 6 years of being in first page of search engine with our hit-blog, we decided to share our service on Fiverr. We are here for all your articles need, quality content and SEO tricks to rank your blog high fast. Give us a try, We will not disappoint you. TechBadoo is a blog for Tech Geeks and Bloggers where we share fresh and updated information related to blogging, Social Media, Gadgets,How-To Guides on Technologies and Softwares, Making Money Online,SEOs and much more related to Technology. You can never get enough of TechBadoo, All the information we give out are authentic and free. © Copyright 2015 TechBadoo - Blogging tips and Tech reviews. Designed by Bloggertheme9. Powered by Blogger.